I've been fascinated by food since I was a little kid. After college I went to the Culinary Institute of America in Hyde Park, N.Y., to learn the basic, classic French cooking techniques. I fell in love with everything about food and kitchens and thought I wanted to be a chef. When I graduated, I worked for Jeremiah Tower at Stars Restaurant. That's where I really started to be able to taste critically and hone my cooking skills. After two years, I started to have thoughts about opening my own restauranta large-scale place, a "fancy" restaurant. But the economic side of the business was daunting. 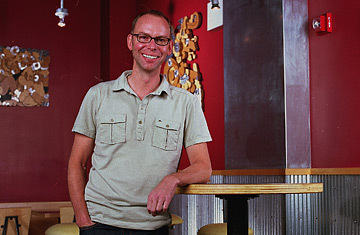 Knowing that many restaurants fail within a few short years of opening, I wanted some sort of backup, so that's where the idea for Chipotle came. It wasn't intended to be my main focus but a cash cow that would help position me to open a full-scale restaurant. I was inspired by eating at taquerias in San Francisco. The giant flour tortilla with the rice, the beans, the meats, salsaeverything rolled up and then wrapped in foil. I hadn't seen Mexican food presented that wayit was usually on a plate with the burrito smothered in green chile salsa. Sitting in one of these taquerias one day, I thought, "What if I brought my own style of cooking to reinvent and lighten it up a little bit?" That's where cilantro-lime rice comes from, and chile-corn salsa. Since it was going to be my little cash cow, it needed to be simple with just a few moving parts and easy to operate. Little did I know that I was planning very well for a large international chain. The first restaurant opened in July 1993 in Denver, near the university on Evans Avenue. It was an 850-sq.-ft. (80 sq m) Dolly Madison ice cream shop that had been in operation since 1924. We kept the original sign and structure and repainted it with chipotle mexican grill in our rusty red color. Chipotle today has an unmistakable look. The layout and some details have evolved, but the basic materialsplywood, corrugated metal, stainless steel, exposed ductworkare the same. These simple materials are elevated to something extraordinary through great design and architecture. And it's a design that is sympathetic to the food. The food is simple; the raw ingredients are very identifiable: chicken, steak, tomatoes, avocados, rice and beans. But we elevate those very simple things through great cooking techniques. Just because you serve something fast doesn't mean that it can't be of the greatest quality.